“I could paint that!” – I bet everyone has said or, at least, thought that while looking at an abstract painting in an art gallery or museum. A few circles, lines, or chaotic dabs of paint on a white canvas – so what? One of my favorite examples is a painting called Black Square by the Russian painter Kazimir Malevich. The title pretty much explains what you can see: a black square on linen. And to be honest, I liked it at first glance! I now know that this artwork is referred to as the “zero point of painting” and that it is a paragon of Suprematism, an art movement in the early 20th century based on pure artistic feeling rather than depictions of representational objects. But let’s not dig too much into art at this point and let’s look at the neuroscientific perspective instead. What is going on in my brain that makes me like Malevich’s Black Square more than other paintings? Why does anyone perceive abstract paintings as beautiful? We may find an answer by looking at neuroaesthetic research, a fairly new and upcoming trend in neuroscience – which does not just deal with paintings but with all kinds of art, like music, for example, as we will see in next week’s post! According to the Copenhagen Neuroaesthetics Conference back in 2009, this field of research deals with “the neural and evolutionary basis of the cognitive and affective processes engaged when an individual takes an aesthetic or artistic approach towards a […] work of art”. By cognitive processes, we mean mental processes of perception, memory, judgment, and reasoning, whereas affective processes relate to moods, feelings and attitudes. The essence of art and the Peak Shift Principle: This law is mainly based on animal studies, which show that an exaggerated/amplified depiction of the “essential features” of an image lead to higher limbic activation in the brain and thus appears to be very pleasant. The limbic brain structures, including e.g. the so-called basal ganglia, are situated roughly in the middle of the brain under the cerebral cortex and play an important role in the neural reward system. In paintings, consider how cartoonists exaggerate the essential characteristics of famous peoples’ appearances (e.g. the lips and ears in the caricature of Barack Obama). This is an example for a peak shift. Grouping: Perceptual grouping (e.g. of colors or shapes) helps us to discover and delineate objects in the visual field (like the Dalmatian dog), which engenders pleasurable rewarding sensations, too. Isolating: Isolating single areas allows us to direct our visual attention more effectively to one source of information, which in turn allows us to notice the essential features (e.g. 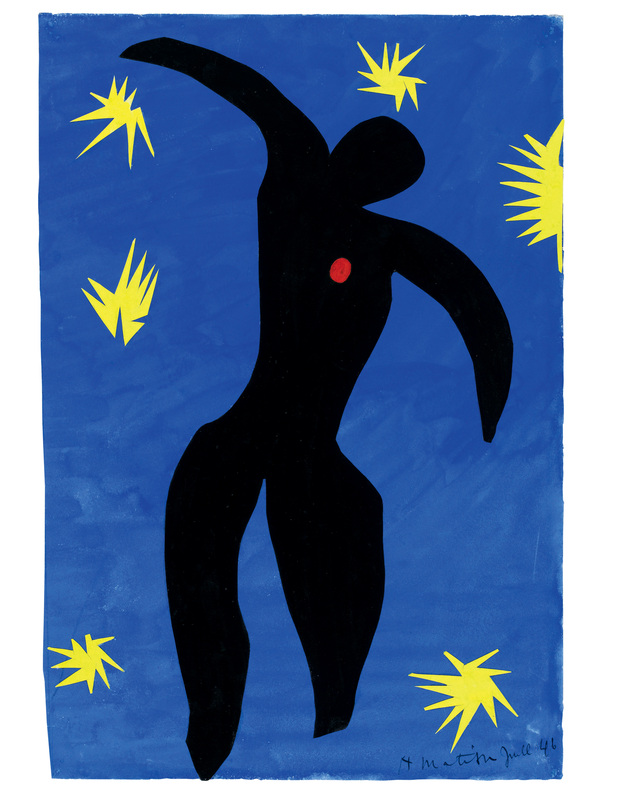 the red heart of Matisse’s Icarus). Contrast: Discarding redundant information and extracting contrast is also reinforcing. Cells in our eyes as well as in our visual brain areas respond mainly to “interesting” contrasts instead of homogeneous surface colors. Mondrian works a lot with color contrast. Perceptual Problem Solving: I like this one! Puzzle pictures may paradoxically be more alluring than pictures in which the message is obvious since the epiphany of solving puzzles may be reinforcing. 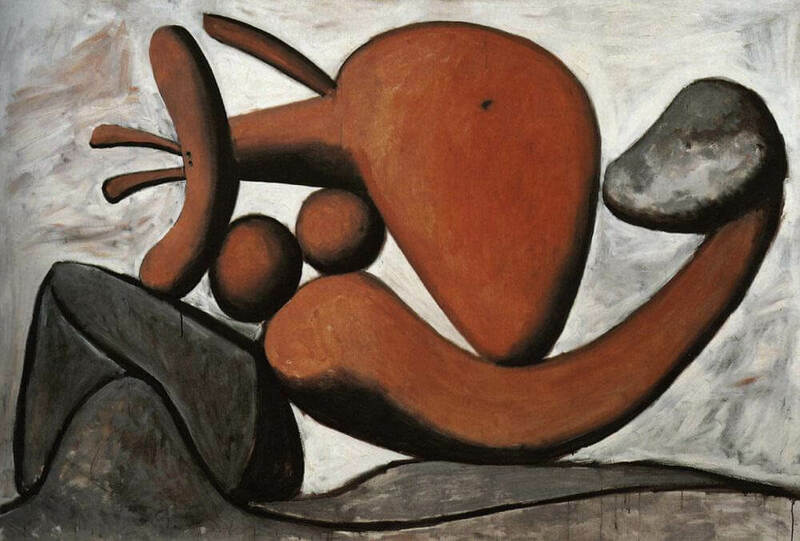 I always have to think of Picasso here… still haven’t solved his puzzle of a woman throwing a stone. Generic Viewpoint: Our visual system hates interpretations that rely on a unique vantage point and favors a generic one. Look at the tree in desert picture: It would be weird and less beautiful if the tree was directly in the middle of the image, right? More generally speaking, artists should avoid coincidences! Orderliness: As a creature of habit, we don’t like deviation from expectations but repetition of patterns and shapes. That is why artists and designers should create a balance between too much order (boring) and total chaos (not pleasing). Looking at Kandinsky’s Squares with Concentric Circles, I think he got the right balance! Metaphor: This “mental tunnel between two concepts […] that appear grossly dissimilar on the surface” allows us to discover hidden similarities. Look at these visual metaphors, your limbic system will be psyched! Symmetry: Our preference for symmetry can be explained by evolution: Former prey, predators, or healthy potential mates all had a symmetric appearance (e.g. the bear on the picture), which helped us to focus on important aspects of our environment compared to unimportant asymmetric ones (like trees, clouds, etc.). So far, so good. Activation of this limbic system and related reward processes by these different graphic principles appears to be a plausible explanation for different aesthetic values of paintings. Of course, Ramachandran and Hirstein give great examples for each law and go in more detail than I did here. But only a few of them (symmetry, contrast, isolating) are applicable to Malevich’s Black Square! I’m still not satisfied, there has to be more. First, he mentions sensory-motor systems, i.e. enhanced activity in visual brain areas in our case of perception of paintings. Early processing of visual aesthetics (e.g. color and orientation) is located in the occipital lobe at the back of the brain. More complex mechanisms like recognition of faces and scenes occur in more temporal structures. Besides these perceptual processes, when paintings depict actions, we can observe activity of so-called mirror neurons in the cortical motor system. Second, the meaning-knowledge system in our brain contributes to aesthetic experience. This may sound quite intuitive as it states that expertise and culture as well as the context under which we evaluate art are important. Finally, regions of the emotion-valuation system come into play, including the reward system to which also Ramachandran and Hirstein refer. Involved brain regions are the aforementioned basal ganglia (e.g. the ventral striatum), areas in the frontal lobe (orbitofrontal and medial frontal cortex) and the anterior cingulate cortex (which surrounds the connection of the two hemispheres). Another active area is the insula, a structure deep in the temporal lobe that is associated with emotional experience. Phew! Interim conclusion: A lot is happening in our brain when we experience paintings! Or how Professor Chatterjee summarizes more elegantly: “Aesthetic experiences are distributed widely in the brain. The popular idea that the right hemisphere is the artistic hemisphere is wrong. The way we value sensory information is instantiated in our reward systems, which in turn are modulated by many factors – context, expectations, personal history and so on.“ In general, neuroaesthetics results from a combination of single areas of cognitive neuroscience like attention, perception, emotion and decision-making. What I like most about this triad of neural systems is that it can explain why people like abstract paintings and why I like the Black Square: “A robust finding in empirical aesthetics is that people with art experience and expertise are more likely to enjoy abstract paintings. Given your liking of Malevich, I suspect you are not a naïve viewer of art.” Thank you Prof. Chatterjee, I think I can live quite well with this flattering answer! In other words, if you don’t like Malevich’s square, you don’t know anything about art… just kidding. “The general hypothesis is that your knowledge comes into play and changes your emotional of viewing such a painting. Studies along these lines (there are not many) show neural activity in the temporal lobes and orbitofrontal cortices, suggesting that memory modulates reward systems.” This again highlights the idea of interacting brain networks. Can we make the brain less receptive to beauty? Let’s have a look at one more fancy study from last December. In their experiment, Koyo Nakamura and Hideaki Kawabata from Keio University in Tokyo used transcranial direct current stimulation (tDCS) to influence the aesthetic evaluation of beauty and ugliness. With tDCS, we can induce electric current to the brain via electrodes. Don’t worry, applying power to someone’s brain may sound like a sophisticated method of torture or, at least, very dangerous and illegal. In fact, it is (with a high probability) totally harmless since neural processes themselves mainly rely on electric signals. In the study, participants rated the subjective beauty and ugliness of abstract paintings in two sessions. Between the sessions, their brain activity was manipulated by two sponge electrodes placed on the head that induced an electric current for 15 minutes. The electrodes were attached over the medial prefrontal cortex and the left primary motor cortex, two areas that were shown to be active during aesthetic evaluation. The study’s main result was that the current between the two brain areas reduced the susceptibility of the medial prefrontal cortex to be activated and led to a decrease in beauty ratings! In other words, participants who received a tDCS perceived the abstract paintings in the second session as less beautiful than before. Since tDCS is a highly discussed and very controversial method of brain stimulation, we should be careful when we interpret findings like these. But given the apparent fact that we can influence aesthetic experience by inhibiting certain brain areas, researchers may be able to assign causal roles in generating the subjective experience of beauty. One of the biggest questions may be why we put so much effort in surrounding ourselves with objects of beauty even if they do not have an obvious utility. “If one is curious about what it means to be human, and operates within a neuroscientific framework, this remains a core area that is relatively unexplored,” Chatterjee remarks. For my part, no matter if I ever completely understand why, and no matter how much current you induce in my brain, I’m sure I’ll never stop perceiving Malevich’s Black Square as beautiful.